Loved the homily so much you wanted to hear it again? Wished you could share it with a friend? Now you can! Saint Patrick Catholic Church & School has entered the digital age with homilies on demand. Homilies are now on our YouTube channel for you to listen to again (and again) and listen deeply (and more deeply) each time you hit play. Subscribe on YouTube and get a notification when the latest homily is uploaded. Homilies are also available with the tap of a button on myParish app on your phone. So, when you are driving home from work or to the supermarket— listen to the weekend’s homily again. You might hear something you missed the first time. March 11, 2018 homily was not recorded due to technical difficulties. February 18, 2018 homily was not recorded due to technical difficulties. February 4, 2018 homily was not recorded due to technical difficulties. Feast of the Holy Family | Father Jerry Graham, S.J. Christmas Day 2017 | Father John Fuchs, S.J. Christmas Eve 2017 | Father Jerry Graham, S.J. Homily | 12.10.17 | 7 PM| Father Steve Lantry, S.J. Homily | 12.10.17 | 2nd Sunday in Advent | Father Jerry Graham, S.J. Homily | 11.26.17 | Father John Fuchs, S.J. Thanksgiving 2017 | Father Jerry Graham, S.J. Homily | 11.12.17 | Father Jerry Graham, S.J. All Saints Day 2017 | Father Jerry Graham, S.J. Homily | 10-22-17 | 8:30 AM | Father Jerry Graham, S.J. Homily 10-15-17 | 7:00 PM | Father Jerry Graham, S.J. 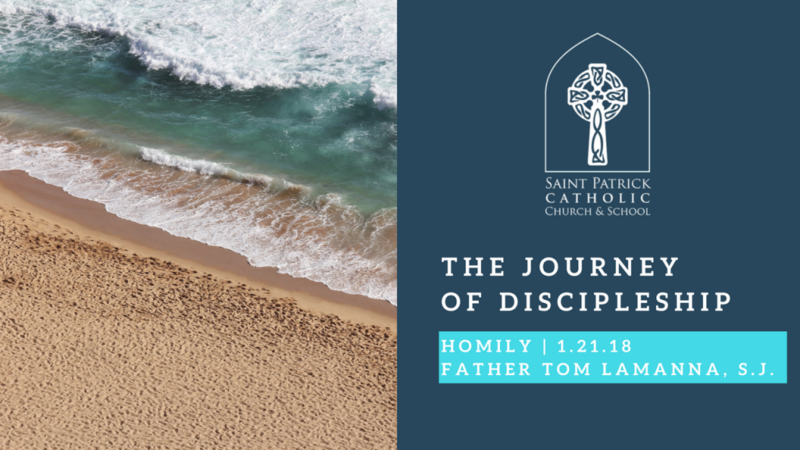 Homily | 10-1–17 | Father Tom Lamanna, S.J. Homily |9-24-17 | Father John Fuchs, S.J. Homily | 9-10-17 | Father Jerry Graham, S.J. Homily | 8-27-17 | Father Jerry Graham, S.J. The Assumption 2017 | Father Jerry Graham, S.J. Homily |8-13-17| Father Pete Henriot, S.J. Homily | 7-30-17 | Father Pete Henriot, S.J. Homily | 7-16-17 | Father John Fuchs, S.J. Homily | 7-4-17 | Father Jerry Graham, S.J. Homily | 7-2-17 | Father Jerry Graham, S.J. 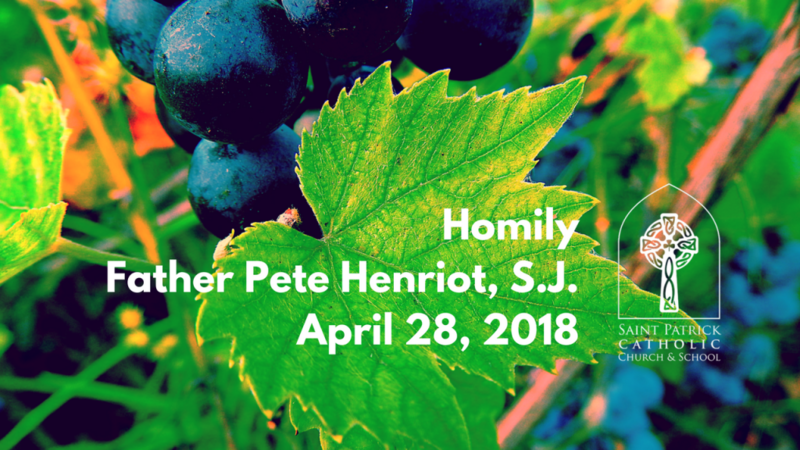 Homily | 6-18-17 | Father Pete Henriot, S.J. Homily | 6-11-17 | Father Jerry Graham, S.J. Homily | 6-4-17 | Father Jerry Graham, S.J. Homily |5-28-17 | Father John Fuchs, S.J. Homily | 5-21-17 | Father Jerry Graham, S.J. Homily | May 14, 2017 | Father Tom Lamanna, S.J. 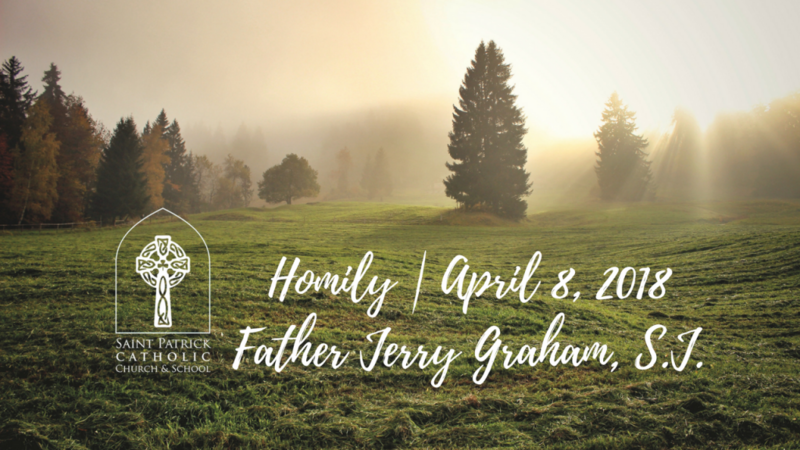 April 30, 2017 | Homily | Father Jerry Graham, S.J. Easter Vigil 2017 | Father Jerry Graham, S.J. Good Friday 2017 | Father John Fuchs, S.J. Holy Thursday 2017 | Homily | 4-13-17 | Father Tom Lamanna, S.J. 4-2-17 | Homily | Father Tom Lamanna, S.J. 3-19-17 | Homily | Father John Fuchs, S.J. 2-19-17 | Homily | Father Jerry Graham, S.J. 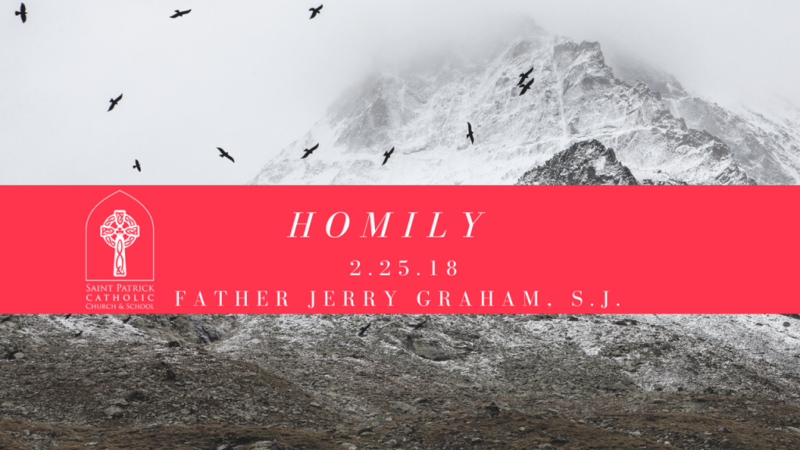 2-12-17 | Homily | Father Jerry Graham, S.J. 2-5-17 | Homily | Father John Fuchs, S.J. 1-22-17 | Homily | Father Tom Lamanna, S.J. 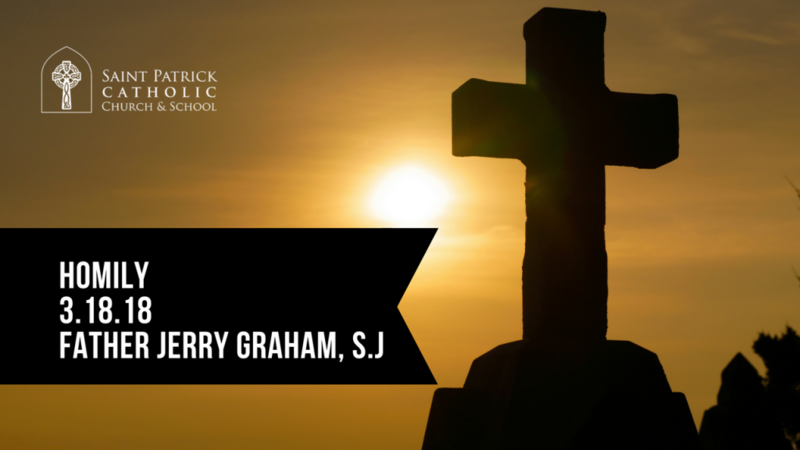 1-8-17 | Homily | Father Jerry Graham, S.J. 1-1-17 | Homily | Father Jim Harbaugh, S.J. Christmas Eve 2016 | 9 PM | Father Jerry Graham, S.J. 12-11-16 | 3rd Sunday in Advent | Father Jim Harbaugh, S.J. 12-4-16 | 2nd Sunday in Advent | Father Jerry Graham, S.J. 11-27-16 | First Sunday of Advent | Father John Fuchs, S.J. Thanksgiving 2016 | Father John Fuchs, S.J. 11-13-16 | Homily | Father Jerry Graham, S.J. 11-6-16 | Homily | Father John Harbaugh, S.J. All Saints Day 2016 | Father Jim Harbaugh, S.J. This week we kicked-off our Stewardship of Treasure Renewal with a Witness Talk from parishioner Greg Unruh after Deacon Bill’s inspireing homily where he encouraged us to look up high into the trees. 10-23-16 Homily | Father Jim Harbaugh, S.J. Learn how Bernie Madoff gets the last word! 10-9-16 | Homily | Father Jerry Graham, S.J. Listen to the homily about how the sacrament of Baptism changes the odds for our children. The scriptures for this weekend speak of the wonderful, positive power of faith amid all kinds of problems and challenges. 9-25-16 | Homily | Father John Fuchs, S.J. We tend to ignore those who challenge us to hear the truth about ourselves and how we should live. But we have also learned that when we take to heart the message of Jesus, we grow towards fullness of life. Today’s readings raise some hard questions. Shall we be like the complacent rich in the gospel, blind to those in need around us? What are the needs–for food, shelter, friendship, advocacy, justice—that we tend to ignore? May we hear and put into practice the truth of the gospel given us through Jesus, who rose from the dead. 9-22-16 | Middle School Mass | Father John Fuchs, S.J. This is the first Mass under the new design of the Liturgy Lunch Club during which a different group of students signs up to spend six lunches over three weeks studying the Liturgy and preparing the Mass. The nine students will prepare the Mass— everything from selecting the readings, developing the Question of the Week, composing the Prayers of the Faithful, selecting the appropriate music from our liturgical music repertoire list, creating the art work, and bringing up the gifts. Father Jerry Graham, S.J., presided over the dedication of the statue of Saint Patrick statue in the meditative garden after the BBQ lunch hosted by St. Patrick Parent Association, Pastoral Council and the Knights of Columbus Tacoma Council 809. The Community Enhancement Project to prepare space in the garden at Saint Patrick Catholic Church for a life size statue of Saint Patrick— the church’s Patron was begun in mid-2015 by James Connelly, Boy Scout Troop 299 member, to earn his Eagle Scout Badge. The statue was installed on Friday, September 16, 2016 with the help and suppport of the Knights. The statue was then dedicated and blessed on Sunday, September 18, 2016 with the help of the parish faith community. Many young people and some young at heart sprinkled Holy Water on the statue of Saint Patrick. The statue commemoratesand honors the many parish priests and decons who served Saint Patrick Catholic Church over the past 100 plus years. 9-18-16 | Catechetical Sunday | Father Jim Harbaugh, S.J. Father Jim Harbaugh, S.J. invited us to be open to learn from the most unsuspecting people. The homily was followed by a blessing of students and catechists on Catechetical Sunday. 9-15-16 Memorial of Our Lady of Sorrows | Father Jim Harbaugh, S.J. Father Jim Harbaugh, S.J. invited the Primary Division students to always remever to comfort and pray for those who a sick, suffering, sad, hungry or those experiencing discomfort. Father Jerry Graham, S.J. invites us to see “what does Jesus want us to pay attention to?” And notes that one of the things that Jesus wants us to pay attention to is joy— the joy in our parish— which Kevin Lovejoy, our Pastoral Coordinator shares with the parish community in the 2016 Annual Report, (begins at the 8 minute mark). The Intermediate Division celebrated the Feast of the Nativity of the Blessed Virgin Mary. Note: Due to technical difficulties, the homily was not recorded. Deacon Bill invites us to be like Saint Teresa. To lean into the darkness and carry the cross. To share our cross with other, allowing them to help us along the way and to pick up the cross of another and help them because by doing this you embrace the resurrection! What does humility have to do with the narrow way of the Cross? Each of us has our own uniquw narrow way which leads us to joy. Listen to Molly Clavenna share her faith journey after Deacon Bill’s homily. 8-21-16 | Homily | Father John Fuchs, S.J. The gate to being saved is very narrow. Listen to learn what Father Fuchs means by saying that. 8-15-16 | The Assumption of Mary | Father John Fuchs, S.J. This ordinary life that we live is sacred. We need to remember how ordinary Mary was so that we can identify with her. We are all called to love and embrace all and accept the will of God. 8-7-16 | Homily | Father Jerry Graham, S.J. Father Jerry encourages us to live with a sense of urgency! 7-31-16 | Homily | Father Tom Lamanna, S.J. The life of St. Ignatius of Loyola. Jesus liked word play. 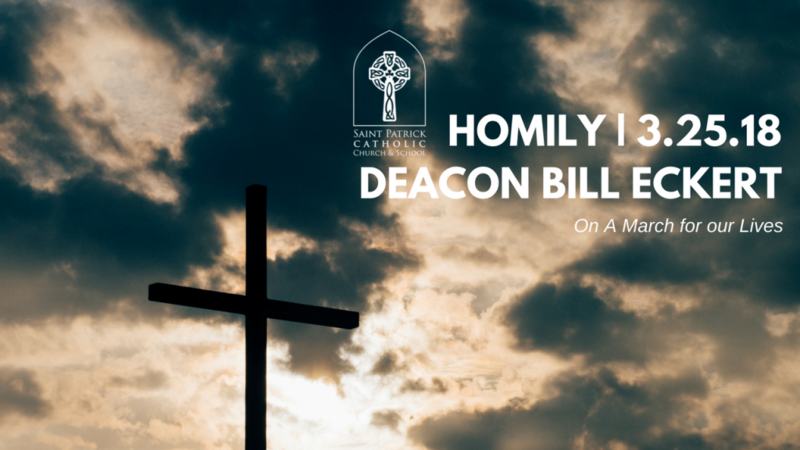 Listen to Deacon Bill explain the Our Father. Are you Mary or Martha? Can we be the heart of Mary and the hands of Martha to the world? 7-10-16 | Homily | Father Jerry Graham, S.J. What are the effects of original sin on today’s society? What can we do in the face of evil? 7-4-16 | Independence Day Mass | Father Jerry Graham, S.J. “What kind of freedon are we celebrating today, ” asks Father Jerry. 7-3-16 | Homily | Father Jerry Graham, S.J. Listen to Father Jerry’s homily on the current state of political affairs and how we’ve lost sight of the need to work together for the Common Good. To work together to reach higher as opposed to lower. 6-26-16 | Homily | Father Tom Lammana, S.J. Listen as Father Tom Lamanna, S.J. explains that spiritual indifference is about love! 6-19-16 | Homily | Father Peter Henriot, S.J. Who is Jesus Christ? Who is He for me? Who is He for you? Saturday, June 18, 2016 six jubilarians and three associates celebrated milestones in their vocational journey. The celebration began with Liturgy at St. Patrick Church in Tacoma followed by a festive celebration in the Church Hall. Family, friends, colleagues, and former members joined in this celebration of life. The décor echoed the theme of the Community Assembly the following week: “Stir into flame the gifts of God.” Learn more. 2016 | 8th grade graduation Mass & Valedictorian Address | Saint Patrick Catholic Church | Father Tom Lamanna, S.J. Deacon Bill opens his homily with a reflection on the tragedy in Orlando, Florida that happened early Sunday morning. The final all school Mass of the year, Father Lamanna acknowledges that sometimes we are all afraid of the dark— a deep instinct within us tells us that the light of God in our hearts is good. Listen to learn more about how Father Lamanna encourages all especially our 8th graders as they move on to high school to let their light of love shine brightly. 5-29-16 Feast of Corpus Christi | Father Tom Lamanna, S.J. Father Tom Lamanna talks about traditions— how they are enacted and brought to the present and made alive. 5-25-16 | Primary & Intermediate School Mass | Father Jerry Graham, S.J. Father Jerry reflects on how we can be the light of the world. Homily begins at the 9 minute mark. 5-22-16 | Homily | Father Jerry Graham, S.J. We find God in our hearts. Where do we see God in our history? 5-19-16 | All School Mass for Pentecost | Father Gerry Chapdelaine, S.J. Listen to Father Gerry’s homily on the gifts of the Holy Spirit! He gets the award for most concise homily of the school year! Homily begins at the 14 minute mark. 5-15-16 | Pentecost | Father John Fuchs, S.J. Father John Fuchs invites us to pray for the gifts that the Holy Spirit bring. 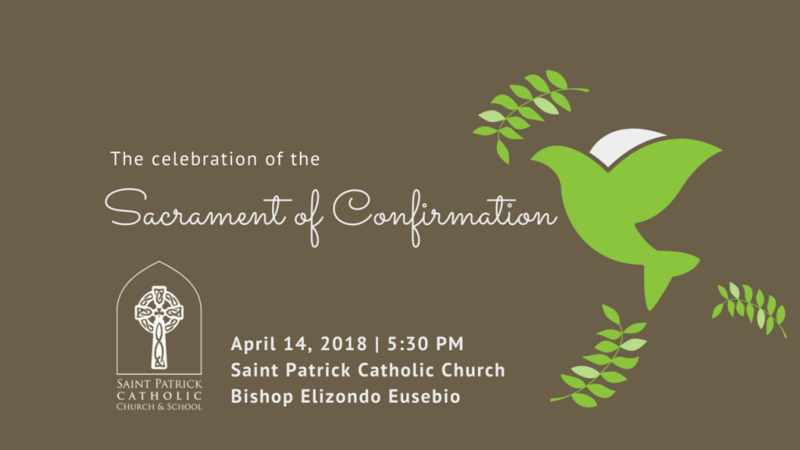 From the Mother’s Day to the Ascension to Pentecost— the Holy Spirit is at work in our parish life including the 14 candidates for Pastoral Council. Listen as Father Jerry Graham, S.J. talks about the dangerous power of God followed by parishioner Garry FitzGerald’s witness talk for the 2016 Annual Catholic Appeal (7 minute mark) and Kevin Lovejoy’s closing remarks (15 minute mark). 4-28-16 | Father Jerry Graham, S.J. 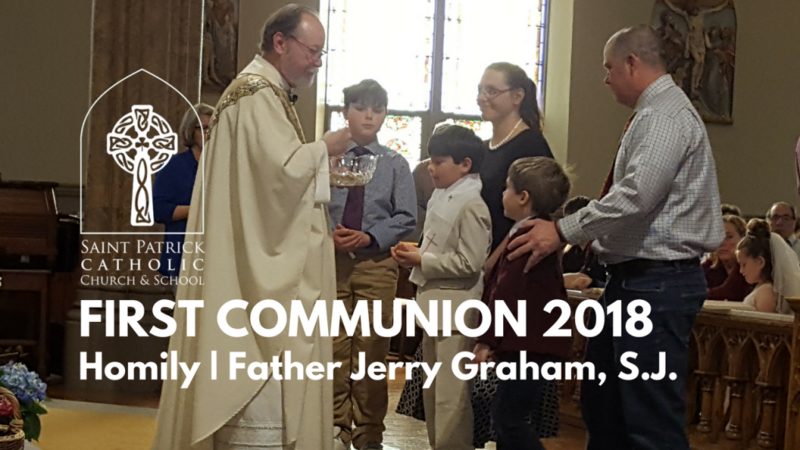 Deacon Bill Eckert invites the children receiving First Holy Communion to the high alter to see the tabernacl, then he explains how our hearts are likewise a Tabernacle for Jesus, and that it is “Through us, and With us, and In us” that Jesus is present in the world. 4-21-16 Earth Week Mass | Father Gerry Chapdelaine, S.J. 4-14-16 | Father John Fuchs, S.J. 4-3-16 | Father John Fuchs, S.J. How can we not believe? The Risen Lord is manifested in so many ways! Listen to learn the many ways He is present in our life as we celebrate Devine Mercy Sunday. 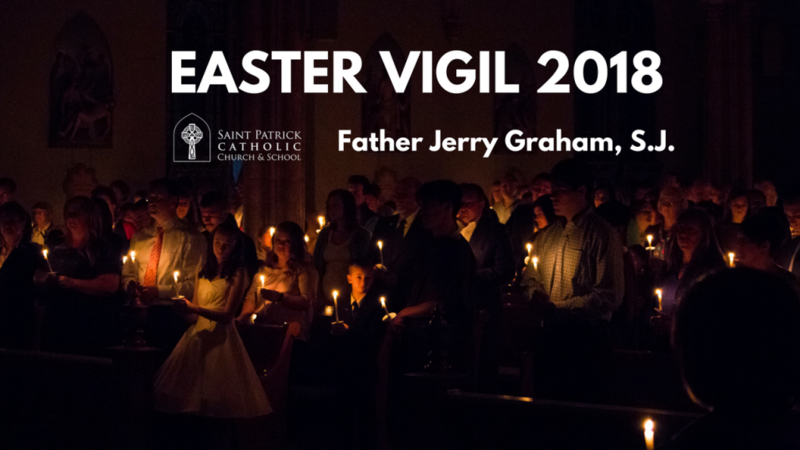 Easter Vigil 2016 | Father Jerry Graham, S.J. Father Jerry ended his homily with the following Easter greeting— “may you leave behind you a string of empty tombs!” Tune in to hear just what he meant by that unconventional Easter greeting. 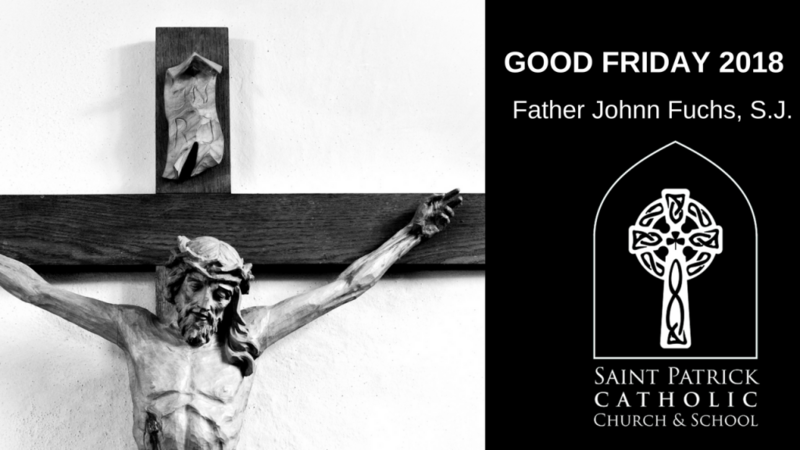 Good Friday 2016 | Father John Fuchs, S.J. Listen as Father John Fuchs, S.J. talks about how Good Friday brings about a feeling of great consolation and deep grief. 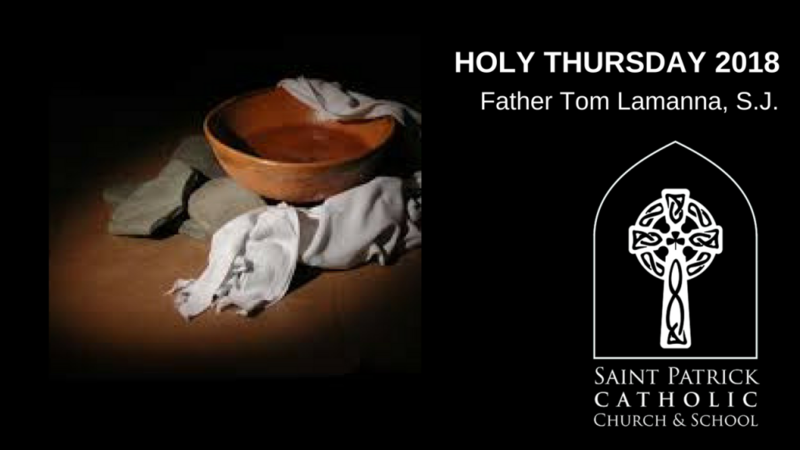 Holy Thursday 2016 | Father Tom Lamanna, S.J. 3-20-16 | Palm Sunday | Gospel & Homily | Father Tom Lamanna, S.J. Please note— there is a gap in the recorded homilies due to equipment issues. We extend our apologies. The issue will be remedied and recorded homilies will again be posted for you to listen to and share with others on or about March 19, 2016. 2-28-16 | Homily | Father Tom Lamanna, S.J. Listen to Father Tom Lamanna, S.J., as he reflects on The First Scrutiny, address sin and God’s infinite love for us. Father Tom talks about God’s healing love and invites all to the Healing Mass of Mercy on March 11, 2016 at 7 PM. The second half (begins at 9 minute mark) is Terese Schomogyi’s (Saint Patrick Catholic School ’12) impactful witness talk, in which she shared some very concrete and personal ways she stays present to God’s presence in her life. 2-18-16 | Middle School Mass | Father Tom Lamanna, S.J. 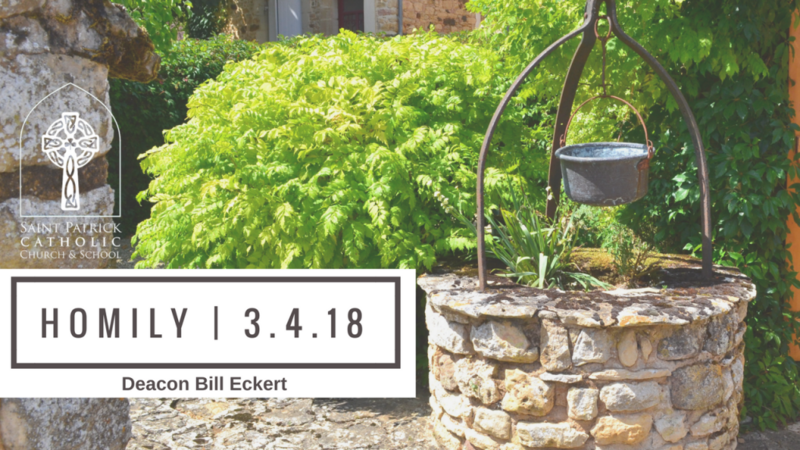 Deacon Bill Eckert shows us that there are no short cuts in life! Listen to learn more. 2-10-16 | Ash Wednesday | Father John Fuchs, S.J. Father John’s encourages us “to do what we always do, but do it more intentionally, and with greater devotion” in the season of Lent. 2-10-16 | Ash Wednesday | All School Mass | Father Jerry Graham, S.J. Listen as Father Jerry connects Ash Wednesday and the liturgical season of Lent to the story of Cinderella at the all school Mass on Ash Wednesday. The Homily begins at the 11 minute mark. 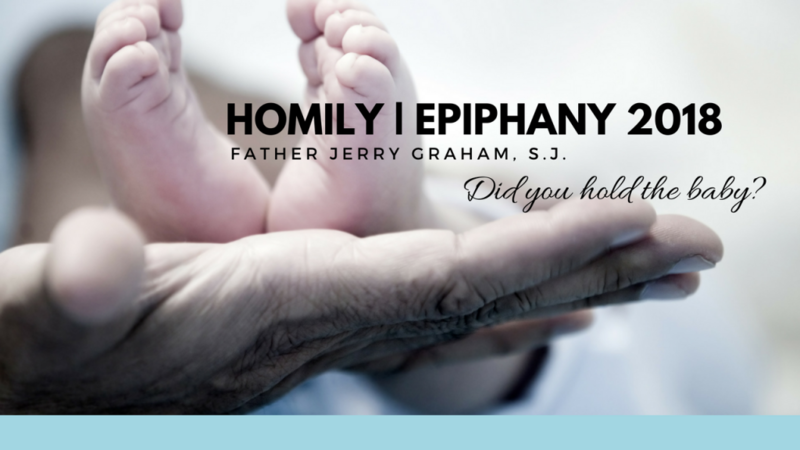 2-7-16 | Homily | Father Jerry Graham, S.J. Listen to Father Jerry’s homily to learn if you are a “fan” of Jesus or a “follower” of Jesus. 2-4-15 | Catholic Schools Week Mass | Father Jerry Graham, S. J. 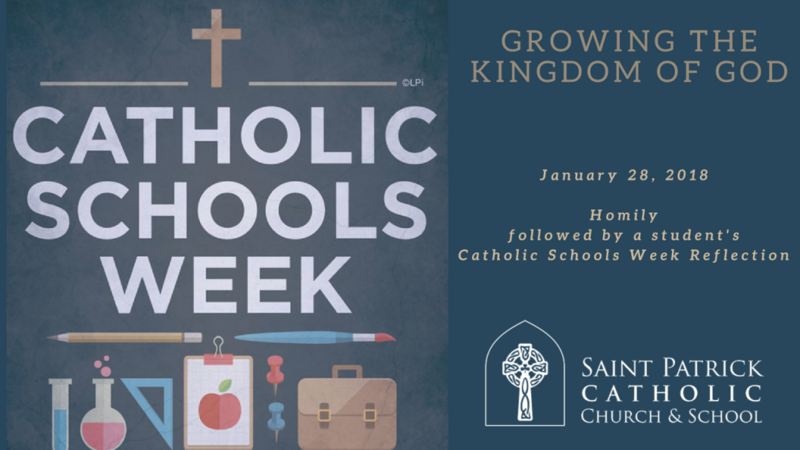 A special welcome was extended to Saint Patrick Catholic School Alumni who celebrate with the parish during the All School Mass in honor of Catholic Schools Week 2016. Click here to tune in as well to hear about the gifts our students shared with Sister Marilyn, Deacon Bill, and the Jesuit team of priests— Fathers Jerry, Tom and John in recognition of their support for Catholic Schools and celebration of religious Vocations. Deacon Bill invites all of us as Christians to substitute our own name everywhere the word “Love” or “It” appears in the reading from Corinthians and see where we can improve, how we can be a more loving person to others. Father Jerry reflects on the day’s readings in his own unique Q&A style homily with the students of Saint Patrick Catholic School. 1-24-16 Homily by Father John Fuchs, S.J. Father Fuchs tells us that the Word of God is very powerful and need to be proclaimed and prayed with. God speaks to each and everyone of us in many ways— from what happens in your heart and mind when you hear the word of God to the signs and gestures we see in everyday life. We need to be open to hearing the Holy Spirit speak to us. 1-21-16 Homily only from School Mass with Father John Fuchs, S.J. 1-21-16 School Mass with Father John Fuchs, S.J. Let your light shine. Own your gifts. Acknowledge the gifts that God has given you. The Question of the Week: The people of Old Testament times cried out to God for the light of mercy during dark times. How did Jesus teach about God’s mercy when the leper cried out to Him? Father Tom shares how both readings are about mercy. Perspective is the key to understanding why. 1-10-16 Homily on the Baptism of the Lord by Father John Fuchs, S.J. What is the script for our life? 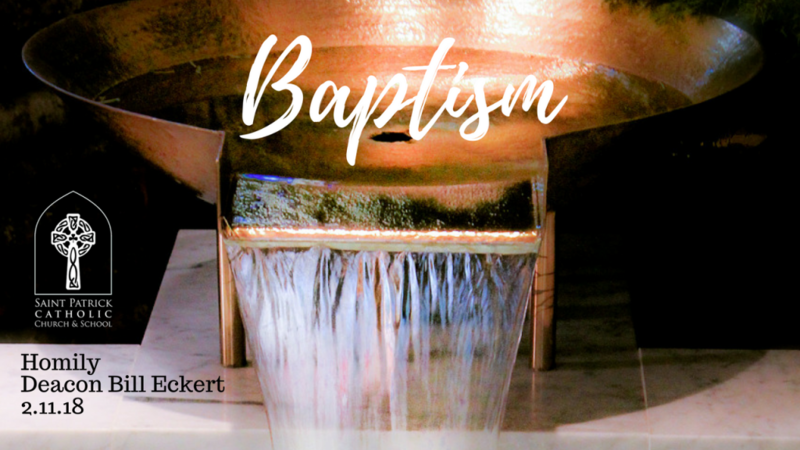 Where do you need to be baptized? Where do you need to let God into your life? God’s grace is like the dew fall. Listen to learn more. Learn how each family— even your family is like the Holy Family. 12-25-15 Christmas Day Homily by Father John Fuchs, S.J. Father John Fuchs, S.J. tells us that Jesus us the human expression of God’s Mercy fo us and invites us to celebrate the joy of the Christmas season through the Baptism of Our Lord— and not stop the day after Christmas as secular culture does. 12-24-15 Christmas Eve Homily Homily by Father Jerry Graham, S.J. A BABY! Listen to Father Jerry tell us why God gave us a BABY to save the world. 12-24-15 The Blessing of the Creche on Christmas Eve by Father Jerry Graham, S.J. Listen Deacon Bill Eckert sing a song about the baby Jesus, hear the Blessing of the Creche by Father Jerry Graham and the Prayers of the Faithful by the children as we begin the season of Christmas in the Catholic Church around the world. 12-20-15 4th Sunday of Advent Homily by Father Tom Lamanna, S.J. Father Tom Lamanna says we have a desire for God to be Emmanual— God with us, but God’s desire to be with us is even greater. Listen to learn more about how we are called to respond to God. 12-13-15 Gaudate Sunday Homily by Father John Fuchs, S.J. Gaudate Sunday— we can’t help but Rejoice as Christ draws near. The readings of Gaudete Sunday speak of rejoicing in the Lord — Christian joy — as well as the mission of St. John the Baptist and his connection with Advent. Father John admits that is not always easy for us to rejoice. His homily invites us to choose to rejoice amongst the darkness in our lives. Joy can be present even in the midst of sadness. 12-8-15 Feast of the Immaculate Conception School Mass by Father Jerry Graham, S.J. 12-8-15 Feast of the Immaculate Conception (Homily only) by Father Jerry Graham, S.J. Father Jerry Graham, S.J. invites us to be like Mary— to light a candle and change the world with that candle. Listen to hear two stories about how the light of a candle was the turning point in history. 12-6-15 Second Sunday in Advent Homily by Father Jerry Graham, S.J. 12-3-15 All School Mass for Advent with Father Tom Lamanna, S.J. 12-3-15 All School Mass for Advent (Homily Only) with Father Tom Lamanna, S.J. Father Tom Lamanna, S.J. talks to the student of St. Patrick Catholic school about faith and love and being “with God”. Maranatha— Come Lord Jesus! 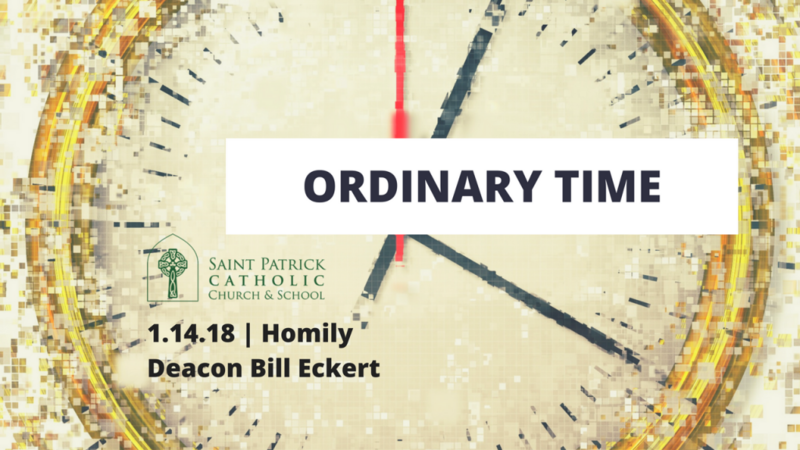 Deacon Bill invites us to look at our past, present and future and how we constantly need to be ready and living in this present moment— armed with candles and flowers. Learn how the seemly small gestures of a candle light or a flower are appropriate symbols of faith, hope, love. 11-26-15 Thanksgiving Day Homily by Father John Fuchs, S.J. On Thanksgiving Day 2015, Father John Fuchs, S.J. asks us to think about “how we called to give thanks to God in all circumstances” and invites us to ponder the fine line between pretending and faith. 11-22-15 Homily and Liturgical Commissioning by Father Tom Lamanna, S.J. Father Tom Lamanna, S.J. invites us to ponder the “banners” that we stand under in his homily before the blessing and commissioning of Liturgical Ministers on the Feast of Christ the King— the end of the liturgical year in the Catholic Church. 11-19-15 All School Mass of Thanksgiving by Father John Fuchs, S.J. Listen as Father John Fuchs dialogues the homily with the school children of St. Patrick Catholic Church— awakening in all of us our tendency to take the many blessings in our life for granted, and the opportunity this special season of the year gives us to pause, remember, and give thanks for who we are and all we have. Please note— there is a gap in the recorded homilies due to technical difficulties on 11-15-15. We extend our apologies. 11-12-15 Homily only by Father Jerry Graham, S.J. Tune in to hear Father Jerry’s pop-quiz homily to middle school students from St. Patrick Catholic School about the KOG— the Kingdom of God. Questions inlcuded when and where is the KOG, and how do our actions make the KOG grow and shrink. The homily was a Q & A style format where Father Jerry asked the students questions like “How would you feel if a pet you loved got lost was found again?” and more. Did you ever think there could be a connection between All Saints Day and a Barrel of Monkeys? 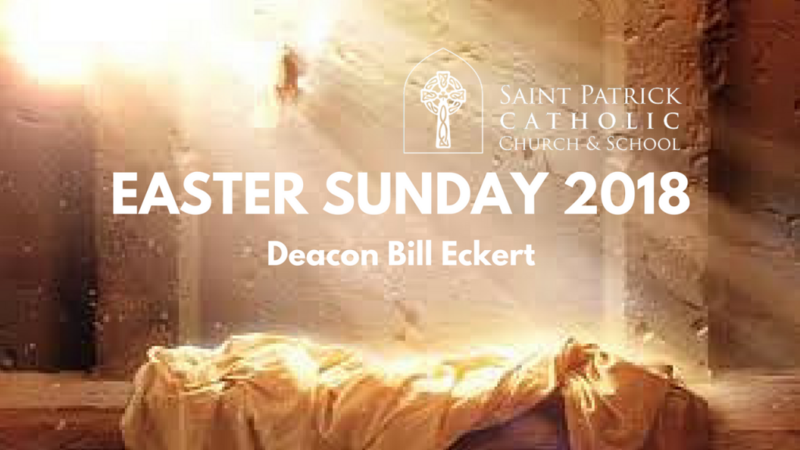 Tune in to hear Deacon Bill’s explanation and keep reaching up to the Saints and out to your Brothers and Sisters in need. 10-25-15 Homily by Father John Fuchs, S.J. 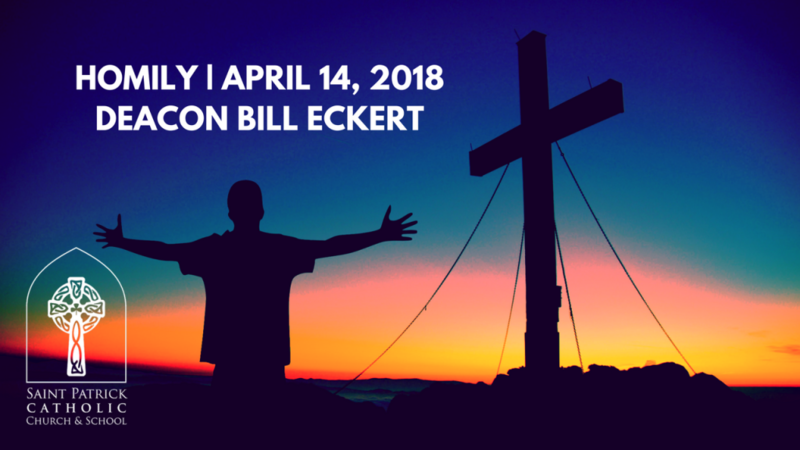 Listen to Deacon Bill describe and SINGING of how Jesus is right along side us as we walk the dark valleys or our lives. We are not alone. Please note— there is a gap in the recorded homilies due to technical difficulties. We extend our apologies. The issue has been remedied and recorded homilies will again be posted for you to listen to and share with others. What kind of car would Jesus Drive?” This is the question Fr. Jerry posed to the K-2d grade students during the homily. He recounted his experience as a young Jesuit novice who was given a new Cadillac as a gift, and how that affected his spiritual life. Listen for more, including his wonderful description of the kind of car the Pope drives! 9-20-15 Homily by Father John Fuchs, S.J. Hear how Father John ran away from school in second grade at St. Patrick Catholic School because he was afraid, and the grace he remembers to this day, when he discovered Sister Pauline forgave him instead of punishing him. 9-13-15 Homily by Father Jerry Graham, S.J. August 30, 2015 by Father Tom Lamanna, S.J. August 23, 2015 by Father Jerry Graham, S.J. August 16, 2015 by Father John Fuchs, S.J.